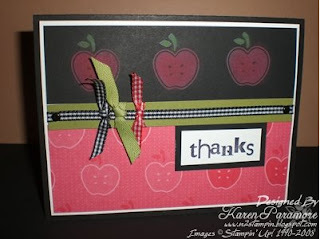 N2 Stampin': Thanks For Our Teachers! This is a card that I had made back in April for a group of teachers that I was working with. I had seen versions of this card on a few sites that I visited but the original card can be seen here on Carol Frerichs site. She has so many great samples to see. The card she made is a 4 x 4 square card but I made mine a standard greeting card size. I thought that this would be perfect to do with my group of teachers. The technique for this card is called the chalkboard technique. This is a neat technique that I had wanted to try. I had originally seen the directions for this technique at SplitCoast Stampers. The tutorial is by the ever talented Beate Johns. The link to the tutorial at SplitCoast Stampers is here. What you do is stamp the solid image with the white craft ink and then use sponge daubers to add the pastels right on top of the stamped images. The chalks adhere to the ink. You then use the swiffer cloth to remove the chalks from the areas around your stamped image where you don't want the chalk to be. This is a really fun technique to do and a very simple card to put together. I also made one of these cards for my daughter's preschool teacher as a "thank you" during teacher appreciation week in May. She really liked it. I hope you like this card. You should try this technique out for yourself and let me know what you think about it. It is really very easy to do.